NRMA Insurance is a national insurance and financial services company. They provide car insurance, motorcycle insurance, home insurance, business insurance, travel insurance, boat insurance, caravan insurance, life insurance, income protection, security and bicycle insurance across Australia. 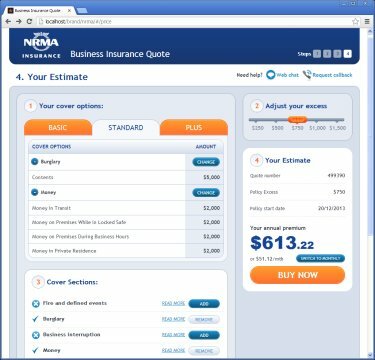 NRMA contracted Kennard Consulting to help build their next generation Online Business Insurance project. The interface made extensive use of modern Web technologies such as AngularJS, JQuery, SASS, HTML5, CSS3, local storage, RESTful Web services and more. Richard has led the way with code quality, testing, a willingness to debate for the greater good and a great attitude to getting things done.